Sweet corn season is a fleeting moment that needs to be savored and captured in as many ways as possible. The golden kernels are at their sweetest when enjoyed from a freshly picked ear. If the corn is not picked at just the right moment, or if it hangs around off the stalk in a truck or grocery shelf, the sugars transform to tasteless starch. 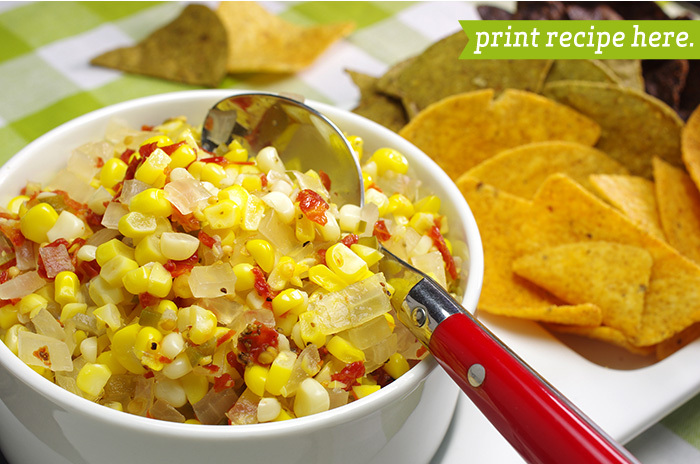 So, know your corn’s lineage and seek the freshest ears of corn you can find, then save some of the freshness with this relish. 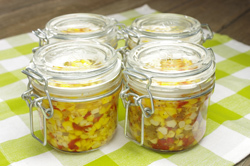 Preserve the relish if you like, or enjoy immediately as a salsa, condiment, or tangy salad side. 1. 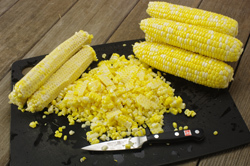 Husk and remove the corn kernels from the cob. 2. 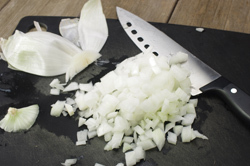 Peel and dice the onion into a small 1/4-inch dice. Seed and dice the peppers into a small 1/4-inch dice. 3. Cut or break the dehydrated tomatoes into small pieces approximating a 1/4-inch dice. 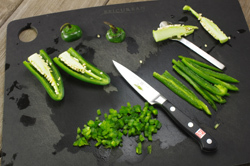 Pour 1 cup of hot or boiling water over the pieces and allow them to hydrate for 15 minutes. 4. 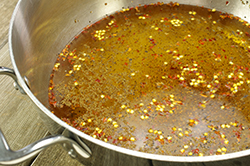 Prepare the brine by adding the vinegar, water, sugar, salt, and spices together in a saucepan. Bring to a boil. 5. 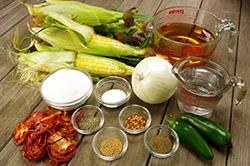 Add the prepped corn, onion, peppers, and tomatoes to the brine and allow to cook for 4-5 minutes. 6. If refrigerator preserving, remove from heat, allow to cool. 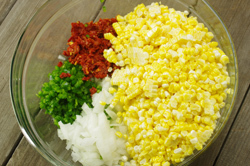 With a slotted spoon fill the jars with the corn relish, and top off with the brine. Store in the refrigerator and allow to cure for 24 hours. Keep in the refrigerator for several weeks. 7. 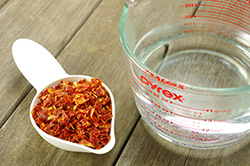 If preserving for shelf storage, remove from heat and with a slotted spoon fill the jars leaving 1/2-inch headspace. Add brine. With a knife or chopstick, prod any air bubbles to the top. Apply lids and rings or clamps. Process in a water bath for 15 minutes. Cool, checks seals, and store until ready to serve.